As Dan Mullen announced the new Florida Gators football coaching staff, one name was probably the biggest surprise: new defensive line coach Sal Sunseri. Sunseri, the 58 year old, 32 year coaching veteran, was gainfully employed when Mullen was hired with the NFL’s Oakland Raiders before Jack Del Rio was let go and Sunseri became available. Sunseri, who has coached for 11 different colleges and two NFL teams, brings more experience coaching defensive line than just about anyone in the country and for four years between Alabama, Tennessee, and Florida State was known as a tenacious recruiter, leading the recruitment and landing National Letters of Intent from Jalen Ramsey, Cyrus Kouandjio, Demarcus Walker, and Josh Sweat and many others. 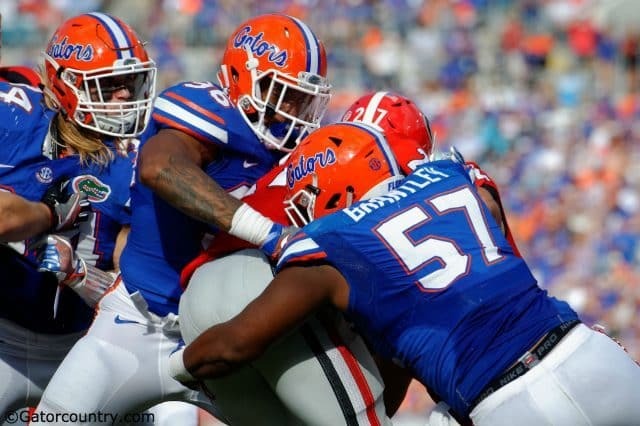 Sunseri has an important role in helping shape the Gators defense, including its shift to a 3-4 scheme, and helping to grow and develop a group that is expected to have big results in 2018. Let’s take a look at some of the numbers that have defined Sunseri’s career. As defensive line coach of the Carolina Panthers, he coached Julius Peppers, Mike Rucker, and Kris Jenkin’s to the Pro Bowl and had a Pro Bowl defensive lineman in five seasons. His team ranked in the top-10 in the NFL in sacks by defensive lineman in five seasons. At Florida State, Sunseri acted as “Defensive Head Coach” and his team finished number one in scoring defense and number three nationally in total defense in 2013. At Alabama, he helped Courtney Upshaw become a finalist for the Lombardi and Butkis trophies in 2011. Sunseri was a semi-finalist for the Broyles Award, for the Nation’s Top Assistant, in 2011 and was ranked as the Recruiter of the Year by 247Sports, also in 2011. At Alabama, Sunseri coached four linebackers to All-SEC honors. At FSU, Senseri helped two players to All-ACC honors. Sunseri helped Rolando McClain to the 2009 Butkis Award. Sunseri has coached in a 3-4 defense for nine of the last 15 years.